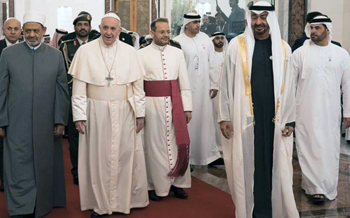 Abu Dhabi, Feb 4: His Holiness Pope Francis, head of the Catholic Church, arrived in Abu Dhabi on Sunday evening to begin his historic visit to the United Arab Emirates. He was received at the airport by His Highness Sheikh Mohamed bin Zayed Al Nahyan, Crown Prince of Abu Dhabi and Deputy Supreme Commander of the UAE Armed Forces, and His Eminence Dr Ahmad Al Tayyeb, Grand Imam of Al Azhar Al Sharif. A number of children lined up with bouquets of roses to welcome the Pope. His Eminence Dr Ahmad Al Tayyeb arrived in the UAE on Sunday and was also received by His Highness Sheikh Mohamed bin Zayed. Sheikh Mohamed said that the UAE has been, and will continue to be, a beacon of tolerance, moderation and coexistence. It will be a key participant in the dialogue of civilisations and cultures, he said, and will continue to oppose intolerance and extremism regardless of its origin, thus embodying the noble human values it believes in as well as the openness and moderation that has always characterised its people. It thus affirms that the UAE's role in spreading tolerance transcends local borders, and that the country's pioneering efforts have made it a global destination to launch civil society initiatives in support of the human fraternity. 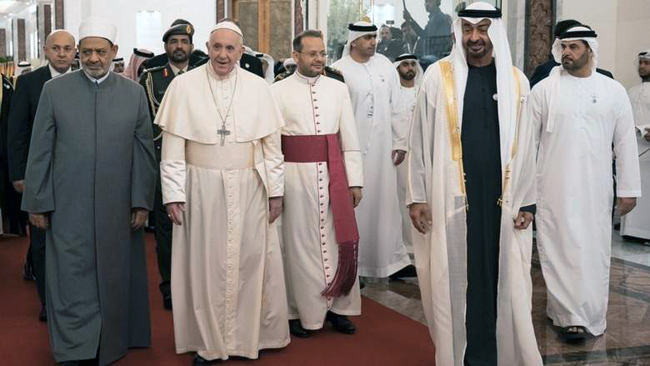 Sheikh Mohamed said that this historic visit to the UAE sends a message to the whole world that the Arab region, the centre of the three monotheistic faiths, whose people have lived in harmony and peace for centuries, is unlike the often invoked image of extremism and terrorism. Rather, he concluded, the Arab region comprises millions of people who believe in coexistence and dialogue and renounce violence and extremism and who are open up to the world and willing to engage with it.